The perfect choice for family gatherings, reunions, workshops and corporate retreats, with bright, spacious rooms, a gourmet kitchen, several rooms suitable for large meetings, many indoor and outdoor recreational choices and much more. Privacy, space and beauty abound at this large cottage, situated on 140 acres of hilly countryside with glorious views in all directions. Enjoy the stars around the firepit, indulge in a festive meal, or engage in a rousing game of pingpong or volleyball as you shrug off the stresses of life at this idyllic, custom-built, ecological retreat. 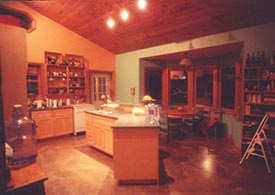 For more information, please visit www.BreatheEasyCottage.com. 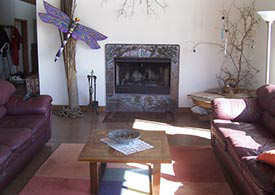 See our website, www.BreatheEasyCottage.com, for detailed pricing and availability.